This time we’re looking at what might be best described as guitar yoga. Get your left hand in shape with this workout by acoustic guitarist Jamie Findlay. The piece is really quite tricky. The left hand changes are particularly challenging. Jamie Findlay is a wonderful acoustic fingerstyle/jazz guitarist. Jamie teaches at GIT in LA. This transcription is from his album Amigos del Corazon and the tide is nearly as tricky as some of the chord shapes in the music. The Art of Acquiring Attributes might have been better titled ‘The Art of Acquiring Sore Hands, Back and Bum While Overloading your Mind and Ears With Some Very Spicy Chords’. I did struggle a bit with the chord changes, although in the end it was very enjoyable to play through. 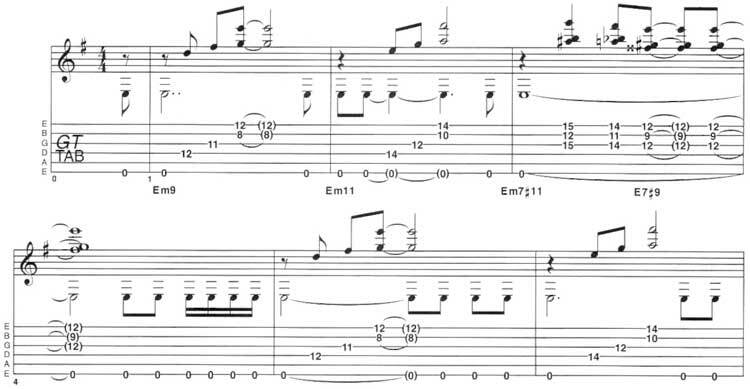 If chord-changing is your weak point, then this will be a very challenging piece. On the other hand (heh heh!) if, like me, you enjoy going a little to the right of Steely Dan, then these chords will keep you in the music chair for quite a few evenings during the coming weeks. The opening section is more dissonant than you are normally used to hearing in these pages. The harsh dissonance of minor second intervals voiced at the top of many of these voicings need to played positively, otherwise they will sound like mistakes! Rather than judge the sound of these chords, play them and listen to them with an open mind. If you have a cut-away in your guitar body some of the chords will be easier than on a standard classical guitar neck. I used my Ovation 14-fret cut-away nylon string guitar for the recording. Check out the suggested fingerings, although you may find better ones for yourself depending on your left-hand span. My left hand is a bit smaller than average – I make up for that elsewhere! (he’s talking about his shoe size – Ed) – but that is not a great problem. When you consider that Django had only two functional left-hand fingers, then you might not complain so much about some these chords! There are no particular technical problems. The timing can be a little loose and the main challenge is to move smoothly from one chord to the next. Give yourself plenty of time with this one – it’s definitely not for the faint-hearted. © 2012 - 2019 TabsClub Powered by TabsClub 42 queries in 0.291 seconds.